Rich and Jean are captivated by one of the most important race cars of our era, the Lola T600 GTP. This is not Bruce Wayne's new ride in Batman VIII, and it ain't the latest Hyundai showcar. It's not a new Consulier, the next Callaway special, or the 1997 Panoz-Reynard Le Mans, either. Despite the fact that it looks as modern as tomorrow, this wild and wooly racing car has already celebrated its 16th birthday and already established an entire racing genre. Meet Lola T600 s/n 1, the 1981 IMSA champ that single-handedly kicked the GTP class to the forefront of 1980s American roadracing. What you have here is one of the most influential designs to see pavement since Colin Chapman put wings on the Lotus 49, and yet it's almost totally forgotten today, too young to be a history piece but too old to be anything but a relic. The time has come to change all that. The Lola T600 (and, to a lesser degree, the BMW-March "Batmobile" which arrived simultaneously) is a pivotally important design. As the first truly successful ground-effects sports car, it would prove to be a seminal influence on every high-level sports-prototype since its debut. After this car, all top protos would either reflect the lessons learned on the T600 or follow rules made to prohibit the lessons learned on the T600! To appreciate the special place this car holds in history we have to go back to 1972, when the FIA made the colossal mistake of outlawing unlimited sports cars such as the spectacularly crowd-pleasing Porsche 917 and Ferrari 512. Instead, the World Championship for Makes shifted its focus to 3-liter Group 5 sports-racers, many of which just happened to be made in France and powered by specialized Peugeot, Matra, or turbocharged Renault engines. Nobody cared much about those Group 5 cars-not even the French. So in 1976 the FIA redefined Group 5 to mean production-based GT cars, and the Championship chase quickly became a one-make stomping ground for the Porsche 935. In 1979, a privateer Kremer 935 even committed the ultimate blasphemy of winning Le Mans outright-driven by Americans, no less! Simply shocking. Along with a general malaise gripping endurance racing everywhere, this final indignity helped inspire the FIA to bring back something resembling the pre-'72 rules concerning unlimited sports-racers. As it turns out, when they'd handed the World Championship for Makes over to the Porsche 935 five years earlier the FIA also codified a new non-title class for Le Mans called Grand Touring Prototype, or GTP. About the only GTP entrants of note were Rondeau and WM, two small French race shops which produced flat-bottom, mid-engined Group 6 cars with windshields and roofs. A Rondeau finally won Le Mans in 1980, which made the French crowds deliriously happy but was still not the excitement generator the FIA needed to lure major manufacturers back into the game. By this point the old stalwarts such as Ferrari, Jaguar, Ford, and Lola had almost totally abandoned international sports-car racing to Porsche, Lancia, and a handful of specialty constructors. So in 1980 the FIA fiddled with the GTP rules. The new regulations were still for sports-racing coupes weighing at least 1764 pounds (800 kilograms), but specifying unlimited-displacement engines controlled only by a fuel-consumption maximum of 600 liters per 1000 kilometers meant that a wide variety of manufacturers could now consider powerplant programs which might come in at a fairly reasonable cost. The maximum width was pegged at 78.7 inches (very wide) and the maximum length 189 inches (very long). In America, IMSA's John Bishop followed the FIA's doings with a mixture of fascination and cunning. For his own series' equivalent, Bishop discarded the Europeans' fuel restrictions in favor of a sliding scale of minimum weight requirements to handicap different types of engines. IMSA also specified that front and rear wheels had to be the same size and that movable ground-effects skirts would be banned, but pretty much everything else was free. By the autumn of 1980, English racing driver Brian Redman-who'd won championships in everything from Formula 5000 in a Lola to the World Championship of Makes for Porsche-had begun working as a salesman for Lola importer Carl Haas in Chicago. It was Redman who first realized that IMSA's GTP category could be a really big deal, and so it was Redman who first flew to England to talk to Eric Broadley at Lola. Redman's idea was to take an old Lola T70 chassis, clothe it with updated coupe bodywork, and go racing. But according to the driver, Broadley simply replied, "No, that's not the way to go-the way to go is ground-effects." That was easier said than done, however. As Carl Haas explains, "Eric Broadley's expertise was in the suspension and handling area; Lola was never very advanced in aerodynamics." So Broadley went looking for help. In 1980, one of the few people who know anything about ground-effects aerodynamics was an engineer named Max Sardou, who was associated with the famous SERA Eiffel wind tunnel where work was currently being done on a ground-effects chassis for BMW. Lola hired Sardou as an advisor. Eric Broadley and Andrew Thorby then built a quarter-scale model based on Sardou's ideas, which they tested in the small rolling-road wind tunnel at Britain's Imperial College of Engineering. They made many detail modifications to Sardou's design, though the overall shape-top and bottom-was pretty much as delivered by the consultant. Sardou inducted air from under the nose and from the natural low-pressure area behind the front tires, compressed it in venturi tunnels on either side of the cockpit-tunnels whose active surface was shaped like an inverted airfoil-and then vented the air out the back through tall voids. Variously called "diffuser tunnels," "air extractors," and "expansion cones," at the rear these tunnels took up all the space between the inner tire and transaxle on each side. The driveshafts simply passed through the expansion area. Aside from its ground-effects underbody, the Lola T600 and March's rival Batmobile weren't particularly radical. Both used an aluminum monocoque chassis with front and rear tubular-steel subframes and semi-stressed powerplants. The Lola's front suspension was typical of the era's racing cars with upper and lower wishbones fabricated from steel tubing and a coil-over spring/shock unit set behind the arms. Rack and pinion steering was mounted high on the bulkhead, and 13-inch Dunlop vented discs, BBS-style centerlock alloys, and Goodyear racing tires lurked inside the wheelwells. At the rear Broadley again specified fabricated upper and lower wishbones plus hefty cast uprights. The only unusual design feature here was the way in which the rear spring/shocks were mounted-in order to leave room for the huge air extractors, the shocks had their bottom mounting point located inside the lee of the wheel rim. 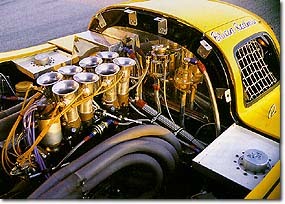 A standard-issue Hewland transaxle was tucked into the center between the diffuser tunnels. Lola intentionally routed its ground-effects tunnels so as to leave the engine bay large enough for most any racing engine its customers might select. The T600 series was mostly campaigned with Chevrolet smallblocks, but different teams also tried things as diverse as the Ford-Cosworth DFV 3.3-liter F1 V8 and even Porsche's twin-turbo 3.2-liter flat-6. In racing tune, these engines gave anywhere from 500 horses with the Cosworth to 570-630 from the naturally aspirated Chevy smallblock and 630 to 750 from the turbocharged Porsche. During the early '70s, scientists at the Eiffel wind tunnel had helped shape some of the all-conquering Porsche 917s, so perhaps not surprisingly, Sardou's prototype proposal was shaped much like a 917 Longtail. Updates included the teardrop-shaped driver's compartment, slightly pinched waist, high rear airfoil, and full rear fender skirts of the Le Mans Rondeaus also developed at Eiffel. By the time Lola got done modifying this basic shape, however, it had evolved into something far more creative. March's car, on the other hand, followed the aerodynamicist's suggestions quite closely. Compared to Sardou's original design, the T600's fiberglass body (as built by Specialized Mouldings) had much swoopier fenders with a smaller-radius edge rolling down to flat sides. The cooling radiators were moved into the rear fenders and fed by NACA ducts. The full-width rear wing was mounted on fins and placed higher than the roof, and the front was cleaned up and given an attractive shovel-chinned outline with faired-in headlights. An auxiliary air intake was later located behind the central duct on the forward edge of the hood, and at the very front of the bodywork sat an adjustable splitter that could be tilted for more downforce or less drag as needed and also used to direct air into the ground-effects tunnels. Overall, the car proved remarkably clean, with none of the add-on wings, spoilers, and wickerbills with which most other contemporary racers were festooned. Broadley did his aerodynamic tuning at the Imperial College-which, remember, had a rolling-floor wind tunnel-before the body was built. The SERA tunnel at Eiffel had a fixed floor, on the other hand, so some of the information Sardou generated there did not translate as well to the racetrack. While Broadley and Thorby were designing the car, Brian Redman was putting together a team to run it in the States. Broadley's deal was that Carl Haas had to buy at least two chassis (at $70,000 each) or it wouldn't be worth the trouble to even start building cars. Once again, however, Lola was almost broke. "I pulled Eric's chestnuts out of the fire any number of times," remembers Carl Haas, "and for 1981 Lola didn't have much going on. The T530 Can-Am car was about it, and they weren't in any major series." While the importer goes on to say, "I thought a GTP car could be a worthwhile project for them," he wasn't prepared to carry Lola again. According to Brian Redman, "Carl said, 'I'm not bankrolling this: You go find two other guys to buy those cars.'" So Redman did. He convinced Trans-Am team-owner/driver Roy Woods and enthusiast/driver Ralph Kent-Cooke to form Cooke-Woods Racing and hire team manager/driver Brian Redman as their first employee. Their second employee would be an English mechanic named John Bright, who was then working as a restorer at the Donington Museum and was, as Brian Redman insists, "Just a wizard fabricator." The team decided to operate out of the Mountain View, California shops of Bob Garretson Enterprises. The car was finished in early 1981 and landed in the States by April. Redman decided to skip the 6-hour Road Atlanta IMSA race in favor of debuting at the hopefully easier 1-hour Laguna Seca event, though the team did put the T600 on display at Road Atlanta to help promote IMSA's new GTP class. March's BMW-powered prototype actually toured Road Atlanta, serving notice that a seed change was afoot. By Laguna Seca, Gerry Davis of Chaparral had built a strong smallblock race engine for Cooke-Woods Racing, John Bright had been over every inch of the car, and Brian Redman had set it up to his liking. But IMSA in those days was still dominated by Porsche 935s, and all the classes ran together; since the turbocharged Porsches had about 630 bhp in their 2300-pound chassis, Redman's 570-horse, 2000-pound proto was anything but a shoe-in for the laurels-especially since the Porsches could crank up their turbo boost for qualifying and enjoy perhaps 750 horses long enough to get onto the grid. In the end, Redman qualified fifth. Brian Redman again: "The night before the race, Carl Haas took his cigar out of his mouth and said to me, 'Brian, if this car doesn't win tomorrow, Lola Cars will go bankrupt!' Eric Broadley was there-looking worried!-along with Ralph Cooke and Roy Woods-also looking worried! No pressure; no problem! "Well, the race starts. Immediately there is something the matter with the car, and it starts getting worse and worse, too. In those days, Turn Two at Laguna Seca was a sharp lefthander with a big earthen bank on the outside. There was no run-off room at all. And as I came off the power to ease up for the turn, the car just took a big shake. In fact, it turned out, it did this every lap. But on the tenth lap, for some reason the car just started to handle okay. Once I realized that, I came from about tenth place up through the field and eventually won the race! "The spring-steel safety clip that stops the wheel nut from coming off was gone, and the wheel nut was all chewed up. The wheel had gotten loose, broken the safety clip, and then tightened itself back on! That's what I'd felt during those first laps at Laguna Seca-and I've still got the wheel nut at home to prove the story!" Lola T600 #1 raced a total of ten times in 1981, and Redman scored five wins and five second places. The car never crashed, never failed to finish, and easily won the first IMSA GTP championship. In the long-distance races the team picked up a co-driver as needed, preferably one who was extremely familiar with the track. At the Mosport 6-hour, for example, Cooke-Woods tapped Canadian Eppie Weitzes. They finished second. The next weekend the team ran another 6-hour race (Elkhart Lake) and finished second, now with Sam Posey co-driving. At Pocono, Ralph Kent-Cooke co-drove and the team finished second again. For a new machine right out of the box-for a fairly radical new machine right out of the box-the T600 proved almost unbelievably reliable, forgiving, and of course fast. This was an astonishing achievement, but Carl Haas puts it all in perspective. "On and off, Lola has built many sports-racing cars. There were a lot of successes, but a lot of failures, too. The T600 was the first modern GT car, and IMSA at that time was just a small niche. Plus you have to remember that the T600 was in very good hands. Brian Redman was truly a first-class driver." Redman adds that "I think if we'd gone into the season looking to win every race, we probably could have-but we only had one engine, and we used a 6000-rpm redline all year because we couldn't afford to blow it up!" Cooke-Woods Racing was not a well-financed team. It had one car, one engine, and not even its own shop. They'd race on Sunday, take the engine out of the car on Monday wherever they happened to be, and fly it down to engine whiz Gerry Davis in Midland, Texas on Monday afternoon. Davis would take it apart on Tuesday, put it back together on Wednesday, and fly it to the next track. In the meantime the team would have driven to the next venue and prepped the rest of the car. They'd get their engine back on Thursday, put it in the car Thursday night, and be ready for practice on Friday! As Redman says somewhat ironically, "It's amazing we never DNF'd." After Redman's Laguna Seca win it was obvious that Lola wasn't going out of business in 1981. The next three T600s went to John Paul Jr., Chris Cord, and Ted Field. Ultimately, says Carl Haas, he sold about a dozen T600s to American IMSA GTP racers and Lola Cars sold another half-dozen to FIA contenders in Europe. John Paul, who'd done incredibly well racing 935s, had his T600 set up with a flat-6 Porsche turbo for Redman and Bobby Rahal to drive at Le Mans. It seemed like a good idea at the time. "The car had never turned a wheel before we got there," says Redman. "First it broke a CV joint in practice. Then there was something wrong with the wastegate so it made no power-it just would not go. We didn't even qualify; it was a real disaster." The car was eventually purchased by Gianpiero Moretti of Momo and it never did much for him, either. One of the problems was that the flat-6 Porsche engine was so wide that it interfered with the ground-effects tunnels and the tunnels interfered with the engine cooling. The result was that the T600-Porsche didn't handle as well as it could have, and it had no power, either. Interscope's Ted Field successfully ran a couple of T600s with smallblock V8s and then decided that the hot setup for IMSA would be a turbocharged 3.4-liter Chevrolet V6. Engine builder Ryan Falconer spent two years developing this powerplant, by which time Field had retired from racing and gone back to the family business, literally leaving driver Danny Ongais standing on the grid of the 1983 Miami IMSA race. Over in Europe, a T600 powered by a Cosworth DFV won at Enna and Brands Hatch in the 1981 championship chase and placed well almost everywhere else. But by far the most successful setup for the T600 was to use a Chevrolet V8 in back. In addition to Brian Redman's five IMSA wins in 1981, the following year John Paul Jr. won one race in his T600 and the Interscope T600 won four with various pairings of Ted Field, Danny Ongais, and Bill Whittington. Paul also won a bunch of IMSA races with his 935, however, so he wound up being the 1982 GTP champion. For the 1982 season Ralph Kent-Cooke wound up taking T600 s/n 1, changing the team's name to Cooke Racing, and moving the shop to Los Angeles. With Woods out of the picture he ran the car in IMSA races with himself as the lead driver and co-drivers who included David Hobbs, Jim Adams, and Josele Garza. When Cooke-Woods Racing came apart at the end of the '81 season, Redman went to work for Brumos Porsche and later found himself driving Jag and Aston Martin prototypes. He continues in vintage cars today. By 1984, the best T600 still in use was owned by Conte Racing and driven by John Morton and Tony Adamowicz, but by 1985 even this car was relegated to back-of-the-barn status. A similar fate befell the T610, a European variant introduced in 1982 to conform to diverging FIA regs. With the success of Lola Cars assured, Carl Haas cut a deal with Paul Newman to form Newman-Haas Racing. Then he hired Mario Andretti and convinced Eric Broadley to develop a cutting-edge IndyCar division, with which of course they've all been tremendously successful. Lola Cars also developed the T710 chassis during 1984, which had an exciting if not entirely successful career as the Corvette GTP in 1985. Next came the T810, another far-removed T600 descendant (and a wildly successful one). The reason you probably haven't heard of it before is that it ran as the all-conquering Nissan GTP-ZX. John Bright drove in IMSA himself for a few years and is now an IndyCar crew chief. Roy Woods and Ralph Kent-Cooke are retired from racing and involved in their respective family businesses. Max Sardou, as mentioned, sold his original GTP design to both Lola and BMW, and while the first March-BMW built to these plans was pretty much a washout, subsequent revisions produced the March-Chevrolet 84G which won the 1984 IMSA GTP title. Lola T600 s/n 1 now belongs to Joe Wallach and is maintained by well-known vintage restorer and racer Bud Bennett. It looks just the way it did at its peak in 1981. Say what you will about the racing cars of recent history, no sports-proto had more of an impact than the T600 over the course of the 1980s. Even the winningest prototype of our age, Porsche's 956/962, eventually yielded to a machine descended from this seminal Lola.